After not posting for almost a month, it's weirdly nice to be back. I clearly didn't miss the hectic housekeeping things that comes with blogging life like pinning, scheduling, and other social media things but I missed connecting with everyone here. While I was too busy eating + resting, what did I miss guys? I want to hear about your Summer plans, exciting news, frustrations, challenges. Tell me all about it. I have few Nepali recipes I want to try in my kitchen soon but for now, enjoy these Easy Superfood Granola Bars. I call them easy because it's literally mix and dump type recipe. While there is no legal definition for super food, I just had to call these super food granola because it's got all the superb nutritious ingredients like quinoa, honey, pumpkin puree, tahini, & cocoa powder. GoMacro is my inspiration behind Easy Superfood Granola Bars; I bought some for my Nepal trip and now I am hooked. I love granola bars that are not too sweet, full of good ingredients, not crunchy or super soft, and simply delicious. 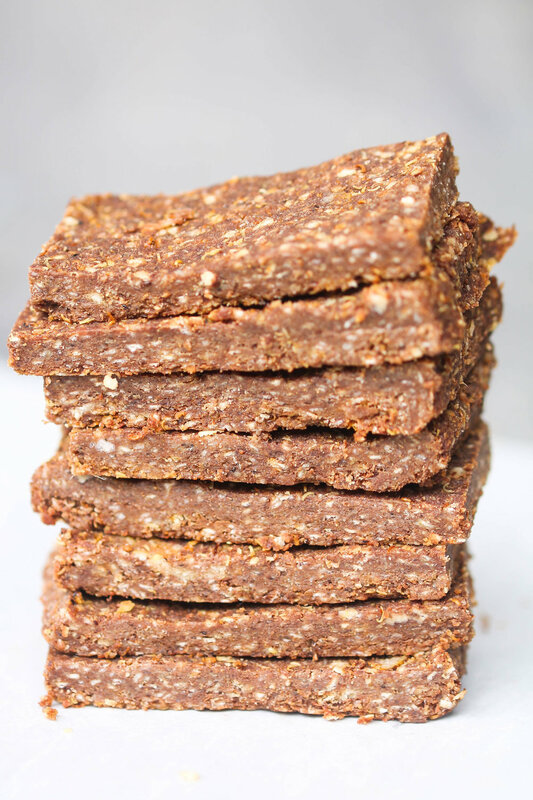 After some tweaking and figuring out my fav superfood ingredients, I am happy to share Easy Superfood Granola Bars with all of the above qualities. Also, these are naturally gluten-free, nut-free, and can be adapted to make vegans (and non-vegans) happy. In a medium bowl, combine toasted quinoa flakes, honey, pumpkin puree, tahini, cocoa powder, and sea salt. Line a loaf pan or 8 X 8 pan (for thinner granola bars) with parchment paper. Pour everything in a pan of your choice. Use your hand or spatula to pat the ingredients down. Refrigerate granola bars in the refrigerator for 1 hour or so until it hardens. Alternatively, freeze granola bars for 30 minutes or so. Cut them into squares or desired shape. **I prefer to keep my granola bars in the freezer, wrapped in a freezer safe ziplock bags. I hope you will make Easy Superfood Granola Bars soon or pin for later!